Different Types of Cat Carrier: Which One Should You Choose? Which type of cat carrier is right for you? How many cat carriers do you need? If you ask me what’s the thing that confuses most travel lover cat owners, then I’ll definitely say buying the right type of cat carrier. Buying a cat carrier is a crucial step if you want to travel with your cat. 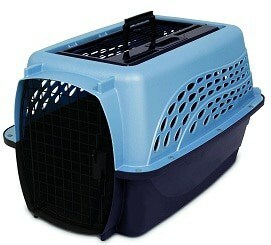 Moreover, a cat carrier is also needed for regular visits to the vet, short trip to relatives etc. That’s why it is super important that you buy the right type of cat carrier for your cat. Frankly, there are many types of cat carriers right now in the market. All of these variations of cat carriers make most cat owners confused and it often leads to the wrong type of carrier for their cat. So, I have decided to put an end to this confusion once and for all by writing this article. In this article, I’ll explain every type of cat carriers available in the market right now to you. Each type has its own set of features, advantages, disadvantages, and specification. So, after reading this article, you shall be able to determine which type of cat carrier is right for you. Though soft-sided carriers are very easier to carry around and travel-friendly, they are only suitable for calm cats. Unfortunately, most cats become nervous during travel. 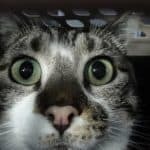 So, if your cats tend to be scared when you insert her into the carrier, then this type of carrier might not be the best choice for your cat. I have heard stories that cats have torn apart the mesh ventilation panels when they became too agitated. Even, some clever cats can work their way out of the carrier by using claw through the chain. If your cat escapes in any manner, it will be a nightmare to find her again. If you decided to get a soft-sided carrier, now it’s time to choose the right size soft-sided carrier for your cat. Your cat should be able to stand up and turn around inside the carrier without any hindrance. Another rule of thumb is to take the length of the carrier and multiply it by 1.5. This should be the length of the carrier. don’t think that the larger the carrier, the better it is. If you buy a too large carrier for your cat, she will feel scared more and hide in a corner. So, always try to get the right size for your cat. It is extremely important for a successful travel with your feline friend. The cat should be able to feel her back against the side of the carrier. it gives them a sense of security inside the carrier. so, if you but a very large cat carrier, your cat won’t be able to enjoy this security and she may hide in a corner. So, when it comes to the carrier, you have to nail the right size otherwise everything will be ruined. Soft-sided carriers are very easy to maintain. Most of these come with a removable bottom pad. So, you don’t need to wash the whole carrier every time. You can only wash the removable bottom. It saves a great deal of time and energy. Another thing to look for is, ensure your soft-sided carrier won’t sag down after a couple of times of use. Check if the carrier has some kind of internal frame to provide a rigid structure to the carrier. sagging bottom is very uncomfortable for both you and your cat. So, a quick way to ensure if the carrier sags down is to put some heavy book and items inside it and check if it can hold its bottom. It has a perfect size and internal space for traveling with your cat. It has 4 times more the internal space of a traditional cat carrier. moreover, the locked zipper feature ensures complete security of your cat. 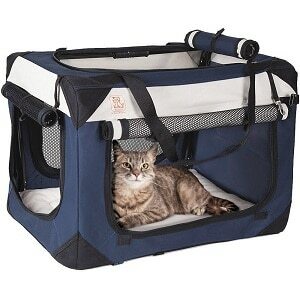 The carrier has the perfect dimension to carry a medium to small size cats. The weight capacity is 45 lbs. So, you can carry at least two medium-sized cats in it. The adjustable padded shoulder straps make this carrier very comfortable to carry. also, the seat belt feature lets you properly secure the carrier with the car seat. it ensures a safe journey for your cat. It also has handles if you want to carry your pet by hand. Ventilation mesh on four sides which ensure complete air circulation inside the carrier and full panoramic view for your cat. Comes with a super soft, fluffy pillow which makes the carrier luxurious for your cat. I definitely think you should give this carrier a try if you want to buy a soft-sided carrier for your cat. Don’t hesitate to check out the current price on Amazon by clicking here. It can be easily guessed that, contrary to soft-sided carriers, hard-sided carriers will be made out of hard materials such as heavy-duty plastic. These types of cat carriers have very rigid internal structure, durability and last for a long time. They are also perfect for skittish cats who become nervous in the journey. These types of carriers are very easy to clean and maintain. They get dry very quickly too! Hard-sided carriers can provide better protection against all type of external impact from your cat. But the downside is, most airlines don’t approve a hard-sided cat carrier. so, if you want to go on an international tour with your cat, hard-sided cat carrier might not be the best choice for you. Hard-sided cat carriers are made of hard materials such as heavy-duty plastic, metal etc. which is more durable than nylon. Most hard-sided cat carriers include a steel mesh door which provides better security to your cat and prevents any unsupervised escape of your cat. Also, the metal mesh panels offer more security to the carrier. Before buying a hard-sided carrier, ensure the quality of the material. Check if the handle of the carrier can bear your cat’s weight. A good hard sided carrier will last you for a really long time. Like soft-sided carriers, you also need to get the right sized hard sided carrier for your cat. Similarly, to the soft-sided carriers, the cat should be able to stand up and turn around freely inside a hard-sided carrier. however, if you are planning for a long road journey, there should be extra space for keeping water bowl, food bowl, and a litter tray. The carrier is made of steel and plastic. So, it doesn’t need me to say how durable the construction of the carrier is. Moreover, it provides safety and integrity to the structure of the cat carrier. this high-graded construction can save your cat from any heavy impacts. The carrier is designed to enter your pet in two ways. You can either enter the cat through the front door or through the top loading system. It is a great feature for cat owners who have nervous cats. The carrier has an ergonomic carry handle which can support your cat’s weight easily and won’t break down at the halfway of the journey. The inner dimension of the carrier is 21″ x 14.75″ x 13.25″ which is perfect for small to medium-sized cats. Ideal for cats no more than 15-inch length and 7-inch height. The outer dimension is 24.05″ X 16.75″ X 14.5″. The only downside I find to this carrier is most airlines dont approve it. So, it might not be the best cat carrier for you if you want to go on an international journey with your cat. So, if you are interested to give this cat carrier a go, check out the current price on Amazon by clicking here. Cardboard carriers can’t hold excessive scratching of your cat for a long time. So, if you plan to use them on a regular basis, you’ll soon find holes in the carrier. You can’t use these types of carriers in rain. They are not water-resistant and will get soaked and saggy in rainwater. Cardboard carriers are not waterproof. So, if your cat has an accident inside the carrier, the urine will leak out of the carrier and ruin your cat seat. For obvious reasons, airlines don’t approve cardboard cat carriers. So, if you are looking for something cheap for one-time use only, you can get a cardboard carrier. However, they are never good for regular use. The first thing you need to do is figure out why you need the cat carrier for. 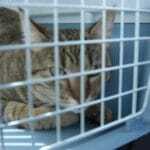 A cat carrier for a long journey and a carrier for short visit to the vet will not be the same. If you want to fly with your cat, then you need an airline approved cat carrier. So, figure out the “why” and it will help you 80% to determine the right cat carrier for your purpose. If your cat remains calm during a journey or car ride, then soft-sided cat carrier may work for you better than a hard-sided cat carrier. on the other hand, soft-sided cat carrier is a big NO NO for skittish and nervous cats. If your cat becomes stresses during a car ride, then go for a good hard-sided cat carrier. A skittish cat will always try to escape out of the cat carrier. so, if your cat is skittish, get a hard-sided cat carrier for her. Hard-sided cat carriers are almost impossible to escape out of. Moreover, most carriers these days come with an internal leash which you can attach to the collar of the cat. It will reduce the chance of your cat’s escaping down to zero. Hard-sided cat carriers are not suitable for traveling by plane. Most airlines don’t approve them. So, if you want to fly with your cat, you need to get a good quality soft-sided cat carrier. Also, check on with your airline to see if the carrier meets all the requirements. I know I have said that the carrier should be at least 1.5 times the length of the cat. However, if you are planning on a long journey by car, then the carrier should have extra space for the food bowl, water bowl as well as a litter tray. The cat carrier should have enough ventilation no matter what type it is. Less ventilation means less comfort and more suffocation for your cat. So, check the ventilation system of the carrier before buying. Check the security system of the cat carrier. The carrier should have locked zipper feature if it is a soft-sided carrier. Most good hard sided carriers have metal doors to ensure complete security of your cat. The carrier should be comfortable for your cat. Most cat carriers these days come with removable fleece bed or cushion pad which provides extra comfort to your cat. The carrier should be easier to clean and maintain. No one wants a carrier that takes ages to clean and dry up. I always recommend getting 1 carrier for 1 cat. So, if you have two cats, get two individual right size cat carriers for them. It is generally not a good idea to buy a big carrier and carry 2 cats inside it. In such cases, the cats may fight each other and injure themselves. 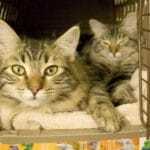 However, if your cats are very well-behaved and behave well with each other, then you can carry them both in a large single carrier. But, it has to be a short trip such as a trip to the vet. Generally, cats do not love to travel. They find it extremely uncomfortable when they are dragged out of their comfort zone. As a result, most cats associate their carrier as something unpleasant and become very reluctant to get into the carrier. so, after getting the carrier, you’ll have to train your cat to get used to it. You should always keep the carrier in a place that is accessible by the cat. Gradually introduce her to the carrier. keep her favorite toys and other items inside the carrier so that she enters into the carrier on her own will. Also, try to feed your cat inside the carrier. This is a long process and needs many other steps to learn. Please check out my how to get your cat into the carrier article to learn more about it. Most cats suffer from motion sickness in a car ride. So, avoid feeding her at least an hour before transporting her to the carrier. if she becomes reluctant, wrap her in a towel and place her gently inside the carrier. Carriers that have top loading feature are great for this purpose. Always place the carrier in the back seat of the car. Never forget to secure the carrier with the seat belt. It is extremely important for the safety of your cat. 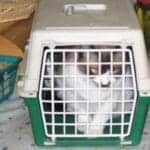 If you want to learn about it more, check out my article on how to secure cat carrier in a car. It is always better to keep your carrier in an open place so that your cat can get into the carrier and leave as she pleases. It reduces the stressed feeling of your cat towards the carrier and helps you to enjoy a more pleasant journey with your cat. So, I hope my guide to different types of cat carriers has helped you to give a general idea of what each type of cat carrier offers and which one to get for your cat. If you still have any inquiry, don’t hesitate to ask me in the comment section below. I’ll reply as soon as I can. Happy cat keeping! How Much is a Cat Carrier? How To Make A Cat Carrier Comfortable?